In the UK the National Curriculum came into effect from September 2014. 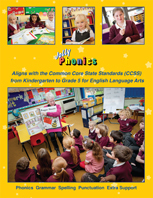 This document shows you how Jolly Phonics and Grammar aligns with the National Curriculum for English and how it can help you to deliver the curriculum. If you are reading the document on-screen, please download this version of the document. Alternatively, you can email info@jollylearning.co.uk to request a FREE printed copy. This document shows you how Jolly Phonics and Grammar aligns with the Common Core State Standards for Kindergarten to Grade 5 classes. Alternatively, you can email jolly.orders@aidcvt.com to request a FREE printed copy.